I thought you might like to see a picture of the cupcakes I just made. They are golden butter cake with chocolate fudge icing. 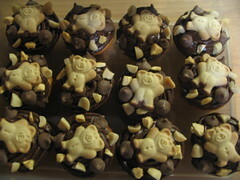 Topped with teddy bear biscuits, chocolate drops, honeycomb and unsalted peanuts. Absolutely delicious, and sublimely extravagant. They were baked in a mini muffin pan, so they aren't too rich.